Surgeons operate the da Vinci system at a computer console close to you where he controls the machine’s robotic arms. Surgeons find the optimal position for the procedure using the Xi’s sophisticated targeting system. Once the surgeon locates the best area, the da Vinci system will configure itself to allow the surgeon a greater range of motion. With pinpoint accuracy, the surgeon then uses the robotic arms to make a series of three small incisions, or ports, in the surgical area. The arms are then inserted into the body. One arm has a tiny video camera and the other two arms are equipped with special surgical instruments. The camera provides the surgeon with a 3D, high-definition image of the surgical site from inside your body, which they can magnify up to 10 times. 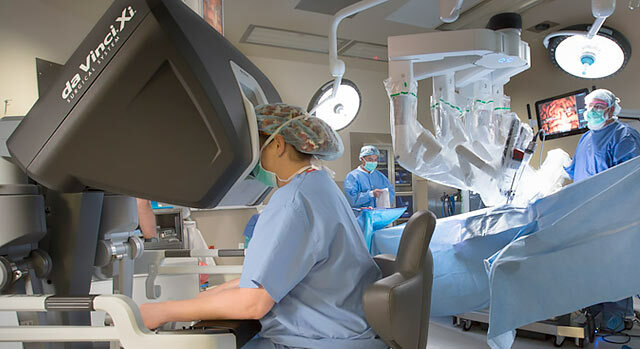 During the operation, the surgeon can take advantage of the enhanced vision and movement of the robotic arms to foster better outcomes for surgery patients. Are You a Candidate for Robotic Surgery? Not all procedures can be done robotically and not all patients are candidates for robotic surgery. Talk to your physician about surgical options using the da Vinci system. If you need a referral to a physician at Valley Hospital, call our free physician referral service at 800-879-0980.